In the late 1960s, many improvements were being made to conventional farm tractors in the interest of operability, safety, and comfort. The farm loader manufacturers of that era had a difficult time adapting to these changes. In 1971, however, Elmer Miller had a better idea. 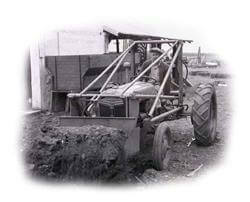 Elmer had his first experience with loader development in the 1940s as the founder of DU-AL manufacturing in Sioux Falls, South Dakota. It was there that he virtually pioneered the old, rickety, cable-operated loaders into the powerful, hydraulic loaders that we know of today. The first loader developed by Miller Loaders Incorporated in 1971 had several patented features that were all based on Elmer's philosophy of strength and simplicity. They included a compact mainframe, heavy-duty construction and a high tip-up bucket. Elmer began making this new loader and sold them directly to the farmer. 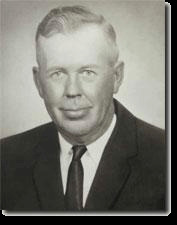 Elmer's son Tom began working at Miller Loaders in 1972, and when Elmer passed away in 1988, Tom became the president and general manager of the company. All of Elmer's ideas and concepts are still implemented to this day in every product made. The original loader, the Model 12, was the primary product until 1993, when Tom developed two new loaders for front-wheel assist tractors, the PL-2 and PL-3. With increasing sales and a developing product line, Miller Loaders frequently added new buildings to their rural manufacturing site. However, in 1996, Tom made the decision to take an important step for the company - entering the computer age for product development and manufacturing. An Engineering Department was created and is headed by Tim Miller, Tom's son. Tim has a Mechanical Engineering degree and uses computers in every stage of a new product's design. Tom and Tim also began plans to build a 25,000 square-foot manufacturing plant. The primary reason for the new building was to get the entire operation under one roof. The new facility also allowed Miller Loaders to update much of the machinery as well as improve material handling capabilities. The building was completed in September of 1998. So, Elmer's concept of strength and simplicity at a reasonable price continues at Miller Loaders. In fact, the basic design of his original Model 12 loader is still in production today - demonstrating that simplicity still works in a complicated world.